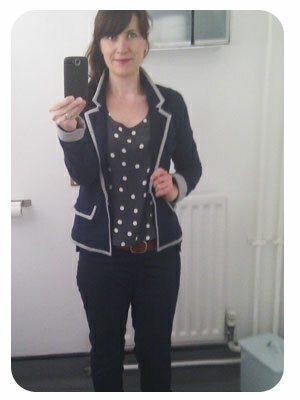 Hooray – a day where I finally had time to actually put this little beauty on and photograph it! 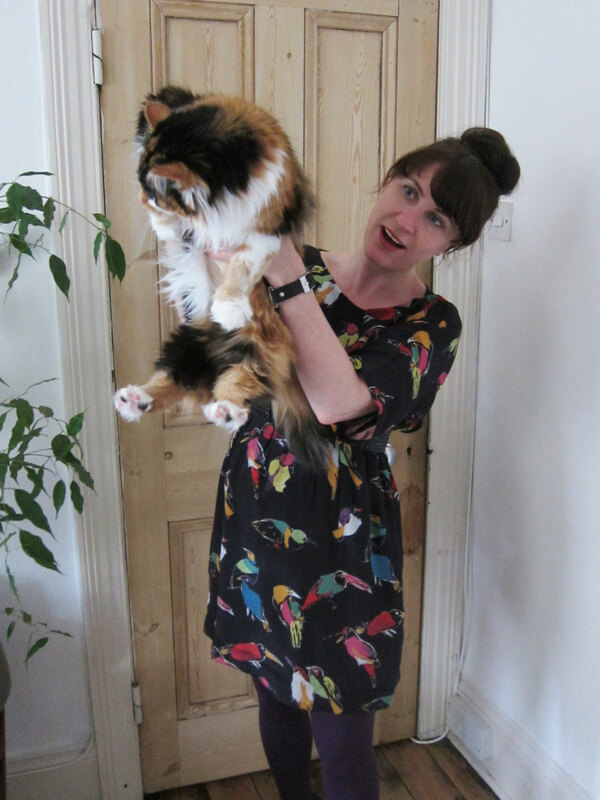 This is my Arrgghh Kimono – that’s an impression of a pirate by the way, me hearties. 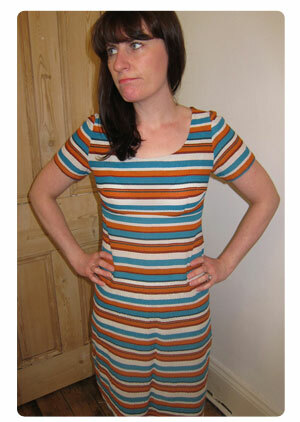 I gave a sneaky peek of this last week but I hadn’t quite finished hemming it. Which proved to be quite difficult actually given the slipperiness of both the outer and inner fabrics – crepe de chine from Marc Jacobs and a slippery plum charmeuse. With multiple ironings and a bit of luck I managed to get it looking even without it slipping on me. I ended up hand sewing the hem as it gave me much more control than using the machine. So this is my first attempt at a Salme pattern. I’m pretty pleased with it overall. It was very simple to put together which made lining it much nicer. Note you must add your own seam allowances though! I raised the waistline by seven centimetres because I wanted the gathers under the bust rather than at the waist. On reflection I wish I’d taken some of the width out of the pattern or cut a smaller size as the gathers feel a bit bunchy, but a belt disguises the join anyway so I’m not too bothered about this. Here’s a peek at the lovely plum lining! I LOVE how the plum is repeated in the parrot beaks! 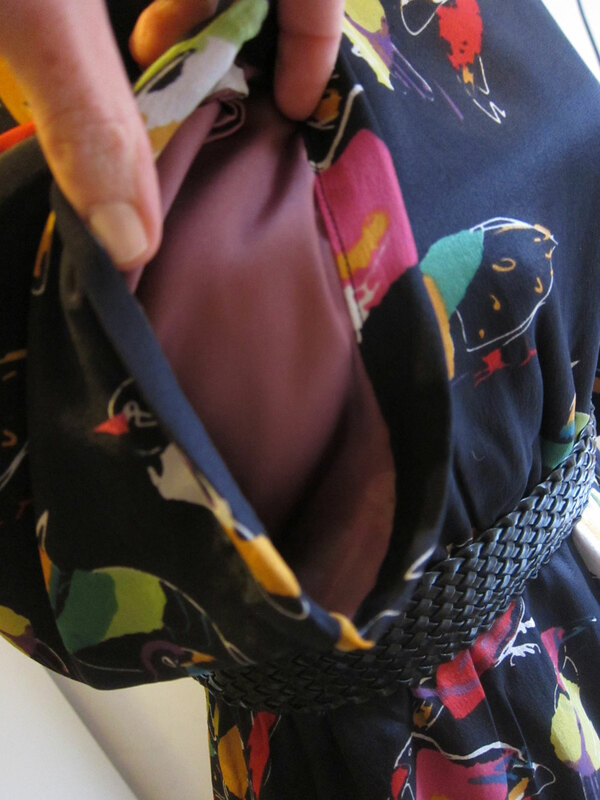 This lining makes a huge difference to the body of the crepe de chine and makes it feel uber silky when I’m wearing it. 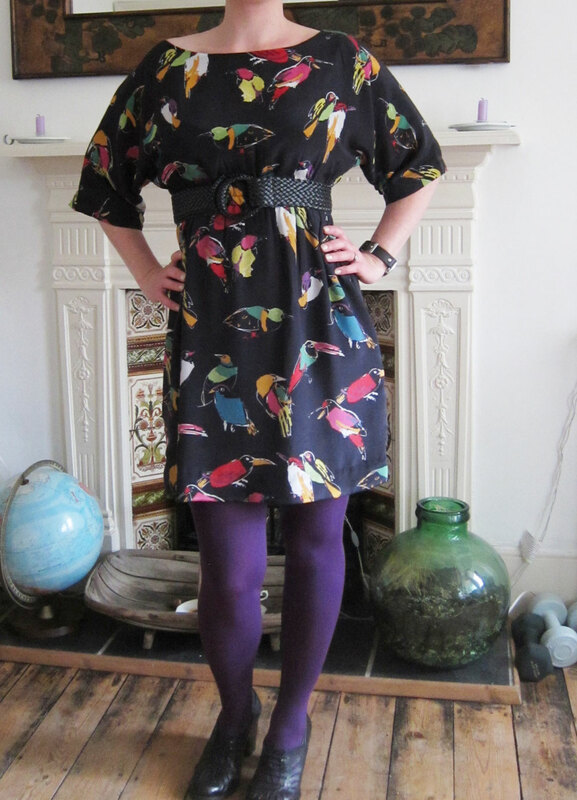 This is my second lined dress – hooray! I like that this is a little different from the vintage styles I’ve been doing recently. It feels quite modern and practical. Less frosting – more cake, albeit a glamorous cake. Not sure what Gracie makes of the parrots though. Should I make her walk the plank? It’s been all go here at S&W towers. I’ve been busy this week crocheting up a storm, whilst the weather continues to NOT play ball. Bad weather, naughty weather. It’s June. Why have I got the heating on again? 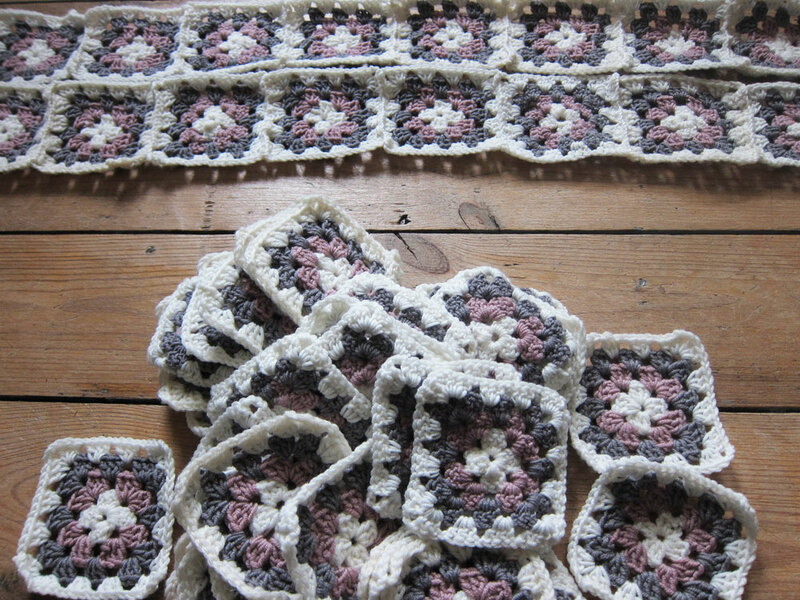 I had crocheted about 120 little granny squares and had started to despair that I’d be crocheting into my pension years before I had enough to make a blanket… until I had the (durr) brainwave of adding an extra outer rim of ivory wool to make them bigger – hence less squares required! Genius? No. Genius for me? Yes. In fact I much prefer them with this lovely soft ivory outline – it should lighten the whole look of the blanket. I’ve started stitching a few together using a basic blanket stitch. I reckon 12 by 12 squares ought to do it. The wool is gorgeous soft merino by Millamia of Sweden but by god it’s expensive stuff. Just one ball sets you back about £5.50 and there’s already at least 14 balls in here. Cripes! And to think I bought a massive crocheted throw off Etsy for about £20 recently. 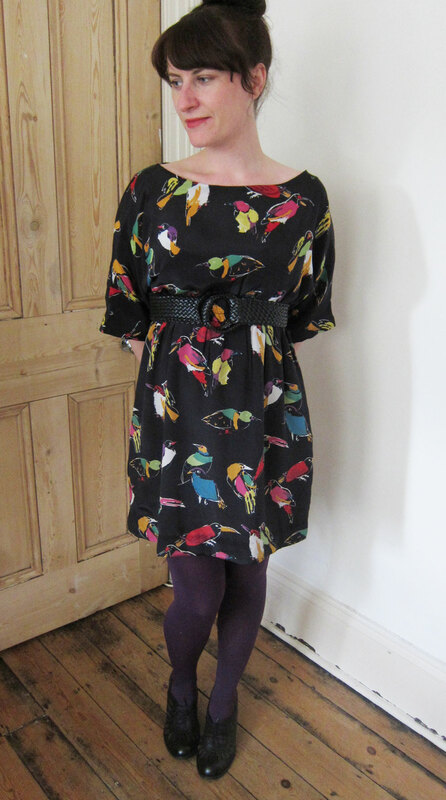 I figured I could easily shorten it to make tops as well as the dress, but first up – the dress! Here’s a sneaky peek. I’ve used some gorgeous Marc Jacobs crepe de chine I’ve had in my stash for a couple of months. I just love these colourful parrots. 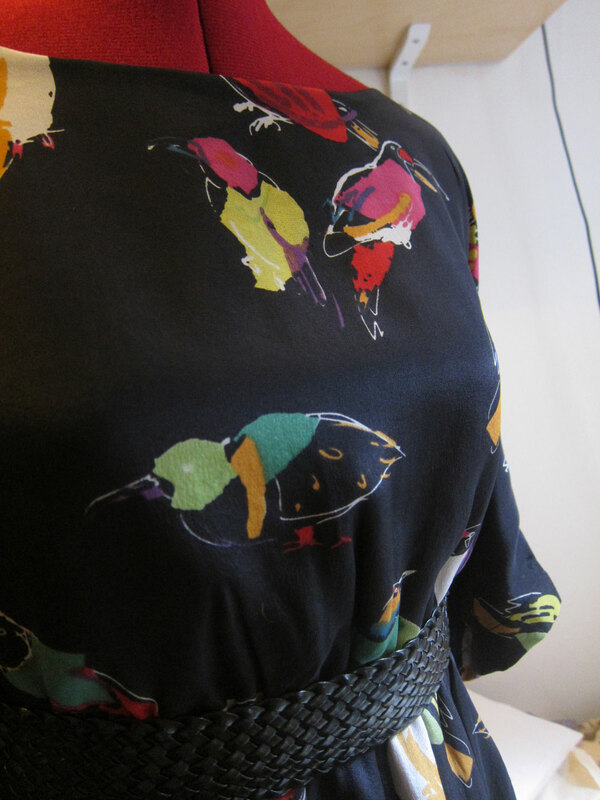 I seem to be developing a taste for birdy fabric! It’s also fully lined with this sumptuous silky plum lining which really bolsters the dress’ volume and makes you feel all slinky when you slip it on. I just have to hem it now. More pics to come later this week hopefully! 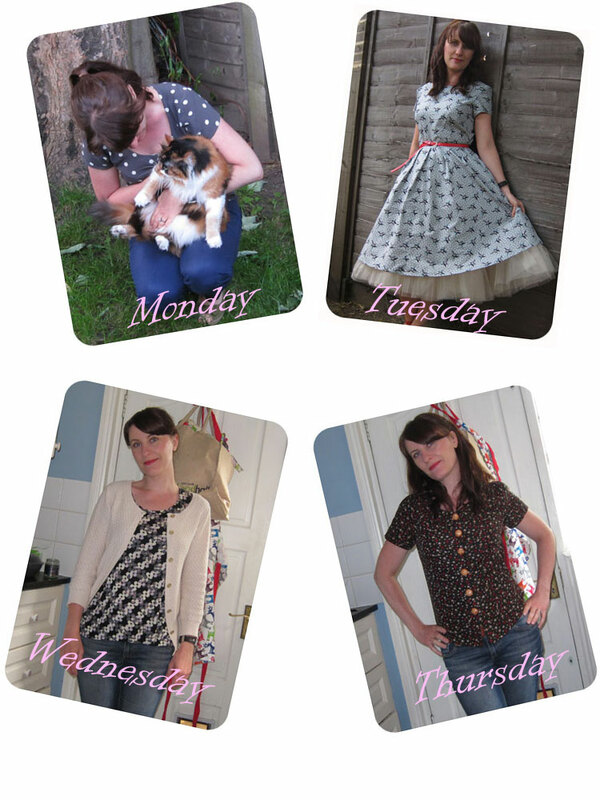 Me Made May has come to an end – over four weeks of wearing self-made clothes on a daily basis; trying to find new and interesting outfit combinations and grinning inanely into a camera 7 days a week. Phew – I’m glad it’s over if I’m honest, much as I enjoyed the whole thing. But as with Self-Stitched-September last year, I learnt a few things along the way… but first – here’s the last round up! Thursday – Old favourite Colette Violet with (yawn) jeans again! That I’m SO not afraid of wearing my own clothes any more – the first time I did a challenge like this was in September last year, after just a few months of sewing. I was utterly terrified that people would point and laugh at me to begin with. Now I wear my own stuff so often I don’t even think about it unless it’s a newly created item or one worn rarely. This tells me that not only am I more confident about the quality of my creations, I’m also way more confident about my own personal style (or maybe I just don’t give a toss what anyone thinks anymore?!). That it’s time to really up the anti and start making some practical everyday items for my wardrobe – even though the idea of making them is scary to me. These include trousers, jeans, t-shirts, more use of jersey and maybe even underwear (gulp!). Scary, but exciting. That I found some great new outfit combinations I can take away from the experience – one of my faves below. That there’s sometimes nothing worse than trying to take a happy pic on a grey drizzly Monday morning when all you want to do is crawl back into bed. That I neglected some of my me-mades over the course of the month because I just couldn’t be bothered dressing them up/styling them which was just plain lazy. These include this, this, and this.Sadly these babies never got worn because I just couldn;t be bovvered. Bad Joanne! I don’t like my Beignets anymore! I’ve gone right off them and I don’t know why. How did you find Me Made May 2012? How has it changed how you feel about your me-made wardrobe? Have you enjoyed the experience? Most importantly – will you be up for doing it again? Finally, a massive thanks to Zoe from whom all this May madness emanates. Without this woman’s genius and passion there wouldn’t be hundreds of ladies getting down in their me-made items every year and learning awesome new things about body perception and their unique style. Viva la revolution!